Plumbers Base is under attack once again and this time it is the army of alien bots. We are talking about the latest action-packed ben 10 fighting game – Ben 10 Battle for Power. As Ben, you must help Rook to eliminate all the power stealing alien bots from the base as well as restore the generators as fast as possible. 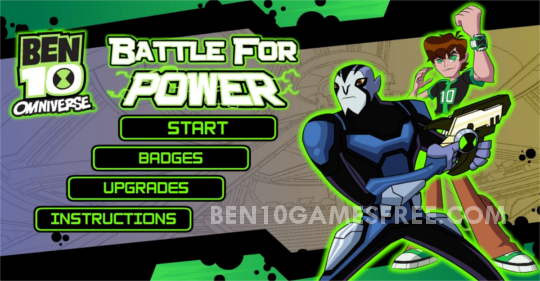 Ben 10 Battle for Power game features both Rook Blonko and Ben 10. The game is set in the Plumbers Base. While Ben and Rook were having a discussion, the trouble strikes in form of alien bots. Rook decides to take them up single-handedly but Ben offers his help to which Rook agrees. Recommended: Play Ben 10 Fighting Games online now for Free! The duo of Ben and Rook are all set to have a head-on battle in Ben 10 Battle for Power game. This game has multiple stages based on the different areas of the Plumbers Base like Engine Room etc. In every stage, there are a number of levels you must cleat to reach the next stage. In Ben 10 Battle for Power game, you have to face various alien bots who are stealing energy from the generators and damaging them. Shoot at them using Rook’s Proto-Tool gun. In case even after the strong battle, any power generators get destroys, Rook can fix them using his powers. Whenever you feel alien bots are getting out control, call Ben for help. Pro Tip: Kneel down to dodge alien bot attacks and you can still fire at them. Complete all the stages to make sure the Plumbers Base is now free from the danger. When you Ben 10 at your side, it is going to be an exciting battle. Well, that’s all about Ben 10 Battle for Power game. Now it’s time for the battle. Battle & eliminate all the power stealing alien bots and restore the power generators to win. Good Luck! Don’t Forget to give your rating for Ben 10 Battle for Power game and share your tips and tricks to win this game in the comments section below.